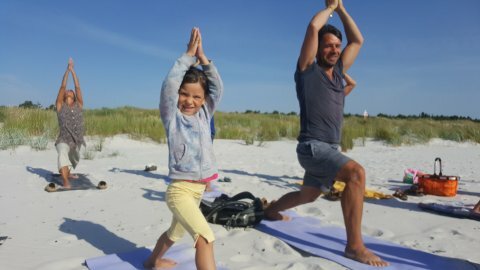 Et mix af yoga og dynamiske bevægelser. Styrke, balance, mobilitet og smidighed trænes og instruktør Nomi Kronberg guider dig igennem en times træning der forener krop og sind. Yoga is a mix of yoga and dynamic movements. Strength, balance, mobility and flexibility are all areas that this class targets. Instructor Nomi Kronberg guides you through a class that will unite your body and mind. No matter what level of fitness you are, whether you are used to working out or not – you will be met on your level. Everyone can participate, and you do not need to have done any kind of yoga before. We welcome you as you are. Yoga mats and blankets are available. Bring water and wear clothes that allow you to move freely. No shoes needed. . The Yoga class always ends with a short meditation.